When Should Employers Consider Criminal History Records? Employers depend on accurate criminal history records when making a hiring decision based on background screening. A criminal background check is used to ensure a safer workplace and reduce the risk of negligent hiring claims. When making a hiring decision based on a background check report, however, the employer must show that there is areason that the criminal record affects the hiring decision. The employer's policy must be reasonably related to the job requirements. Employers should carefully consider hiring decisions based on criminal history records. With Fair Chance and anti-discrimination laws sweeping the country, many cities and states have already banned the box that asks, "have you ever been convicted of a crime?" on employment applications. The decision to inquire about criminal convictions is pushed to later in the hiring process, typically after the offer of employment or promotion. After the offer has been extended, the applicant must then give consent and authorization to a background check. The consent form must be a standalone separate document and clearly state that the offer is contingent on the results of the background screening. The applicant must also be aware of which background checks will be run and their rights under the FCRA for disputing any results. Employers that will be making hiring decisions based on the results of a criminal background check should be aware of when and how criminal records will be applicable. Some state laws limit the use of criminal records in hiring decisions, including when convictions can and cannot be used. For a list of states and their regulations, review this list on the Workplace Fairness website. The EEOC issued an Enforcement Guidance on the use of criminal records in hiring decisions to protect an individual's rights under the Civil Rights Act of 1964. The guidance states that employers must conduct an individualized assessment of the applicant and their criminal history. 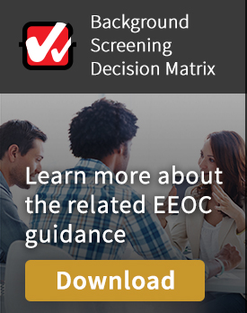 If an applicant is denied employment and seeks to pursue a claim under the EEOC, the employer bears the burden of proving a consistent hiring policy and the use of a decision matrix in their denial of the applicant. When an applicant will be denied employment or a promotion due to the results of a background check, the employer must notify the individual with pre-adverse action. The pre-adverse action notification will inform the applicant of the decision and the reason related to results of the background check. If the applicant doesn't dispute the results of the screening, the employer must then follow adverse action procedures. Employers must be sure to document the denial of employment, the reasons why, the decision matrix that shows consistency when assessing criminal history for jobs, and that state and federal laws were followed. Employers that want to keep theft and violence out of their workplace are wise to run criminal background checks. Even wiser is to be aware of the regulations that could prevent the use of the applicant's criminal history in hiring decisions. For more information on criminal background checks and screening compliance, download the ebook below.